Barbara where SVH is working. Identify and support village leaders, including women and young people, so that improvements in village life continue into the future. These goals form a whole. It takes local leaders to identify and develop better sources of water and these in turn make crops and family gardens more productive. More varied diets improve family health. More abundant crops can be sold to increase family income. Vecinos staff spend much of their time training men, women, and youth to train other villagers in sustainable agricultural techniques or practices to improve family health. From this campesino a campesino (farmer to farmer) exposure to people in other villages, villagers gain confidence in their own knowledge and make connections with people in other villages for solving problems they have in common. Vecinos/SVH works in eight SVH villages in the department of Santa Barbara. Six of them, El Zapotal, El Chol, El Tule, El Tulito, La Majada, El Cablotal are shown in the photo of a map of the Zapotal watershed. These villages are among 15 villages in the municipality (functioning as a county) of Chinda. Two others, El Puente and Cececapa belong to the municipality of Illama. Map of the Zapotal watershed showing six of the eight SVH villages: El Zapotal, El Chol, El Tule, El Tulito, La Majada and El Cablotal. 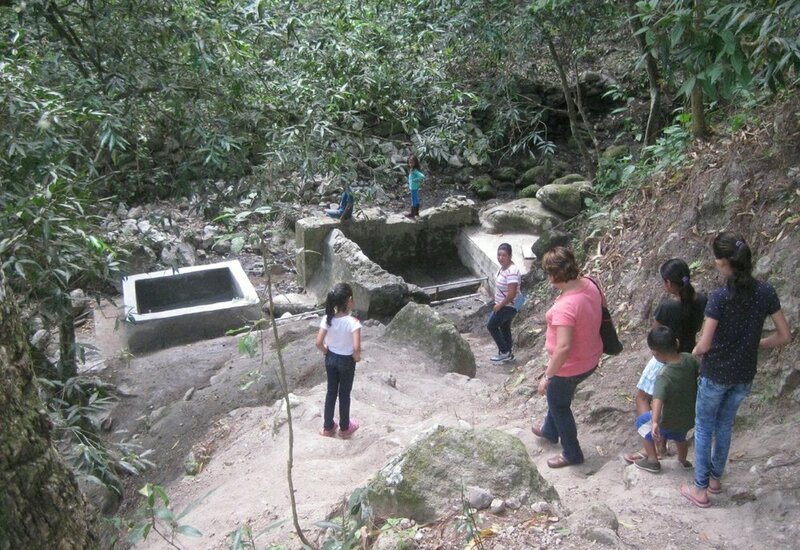 View downhill to the restored water storage basins in the new park created by dozens of residents of El Tulito, La Majada, and Las Breas.